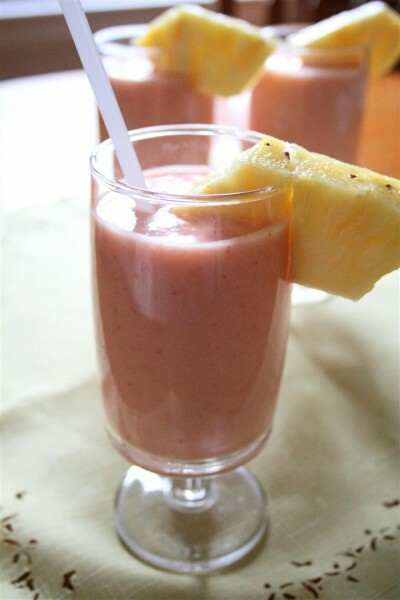 Strawberry Pineapple Smoothie was posted on April 13th, 2011 and is filed under Breakfast, Dairy Free, Drinks & Smoothies, Recipes, Vegan. This entry has 8 comments. You can follow any responses through the RSS 2.0 Comment Feed. So my holiday with my sisters has been awesome…I apologize for not posting according to my usual schedule, but I don’t get to spend much time with my one sister because of the distance factor and that’s more important to me right now. But I’ve still been having fun in the kitchen…the three of us sisters have been making all sorts of things. My sister has been the Pancake Creator, which has made me extremely happy (pancakes are one of my weaknesses! ), and I make the smoothies. I tend to go banana heavy when I make smoothies, so I’m trying to not put them in every single drink I blend. Boring. Here’s one I created a few days ago…banana free. This serves 3. Check out the fact I’m doing protein in the morning in the picture below. Scrambled eggs. This is what it looks like with my venture to eat protein at every meal. This morning it seemed like my attempts were about to be thwarted. The fridge was empty so I just had toast…there was no eggs in the egg carton! It seemed all was lost…then in the corner of my eye I saw one lone, little egg on the shelf of fridge door. Saved! Epic story, I know. *Please note that the nutritional facts will vary according to what kind of fat percentage of coconut milk you use. When I worked out the nutritional information, I used full fat coconut milk, so it will be more or less depending on what choice of milk you use. Do you tend to always put the same ingredient in your smoothies or recipes? Looks good! do you use canned coconut milk??? I accidentally bought pineapple instead of frozen bananas one time at the store and decided to go with it in my smoothie. I like them string free, so always have to really process those little buggers, but have found the flavor is really refreshing. Kelly~ Yes, typically. But I’ve tried the homemade version and it’s really great too! Clarkie~ Agreed! If you invested in a high-speed blender like Vita-Mix, it would be very easy to process the “stringyness”! I have no idea how I did it before the Vita-Mix…but you have patience. Something I’m not particularly good at, lol. This looks so refreshing and healthy! It’s getting hot down here in Florida… I’ll have to whip one up! 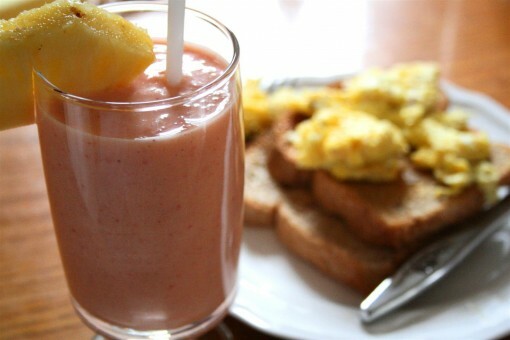 I love pineapple smoothie..been having this for breakfast once every other day for the past 2 weeks. Will make it with some coconut milk next time! Thanks. Ally~ Nope, you’re right! You can’t! Lisa~ You’re so lucky! It’s just starting to warm up where I live…I’m so jealous. I’m craving sunshine! YiYi~ Aw, so glad you like it! I love it with coconut milk because suddenly it becomes so much more creamy!